“In the name of Vedic civilization, a fabricated history of India is being taught in the universities of the country. There was nothing like Vedic civilization but only Vedic culture and even for the latter, there are no credible facts or bases,” said well-known critic Rajendra Prasad Singh at a seminar on “Bahujan literature, society and culture’ organized by Baghdor at the Gandhi Museum in Patna on May17. He presided at the seminar. In his address, Singh analyzed in detail the biases informing the historical and literary writing in our country. Bijendra Prasad Yadav, minister for finance, commercial taxes and energy, in the Government of Bihar was the chief guest at the seminar. “Politics can only change rulers,” He said. “Movements were and are needed for bringing about societal change.” Taking a dig at Indian culture, he said that it was a culture of “saints, feudal elements and charlatans”. On this occasion, the Bahujan Literary Annual of FORWARD Press was released. Dalit writer Buddhasharan Hans said that shunning religious hypocrisy was essential for the welfare of the Bahujans. It was sad, he said, that ideological streams like those of Ambedkar, Phule and Jagdev Prasad’s Arjak Sangh have lost ground. Journalist Shrikant said that he was happy that writers like Pramod Ranjan were taking forward the work of Triveni Sangh – which he had brought before the world – in the field of literature. He said that caste is not a stagnant but a dynamic unit. The meet was also addressed by critic Mahendra Suman, writer Hasan Imam, Professor Saeed Alam, Backward classes Commission member Jagatnarayan Singh Yadav, journalists Hemant Kumar and Ashok Yadav, and social activist Santosh Yadav. Arun Narayan conducted the proceedings while Arun Kumar proposed a vote of thanks. 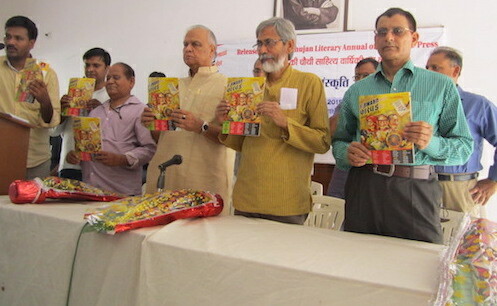 Around 200 writers and intellectuals from different parts of Bihar attended the event.